Neill personally introduces us to his new online ordering service designed for clients to effortlessly purchase his new Collections of exciting spring flowers including a magnificent selection of bouquets and arrangements for the upcoming International Women's Day, Mother's Day, Persian New Year and Arab Mother's Day, all in the month of March. With same day deliveries guaranteed throughout central and greater London. Following persistent demand from my clients, I am absolutely delighted to introduce you to our new online ordering service with a Spring Collection which showcases the glorious blooms of our growers in a stunning range of designs to suit all tastes and styles. With March being a month with many feminine celebrations (Mother's Day and International Women's Day) combined with the sweet tones of the season, you will find many bouquets and arrangements in soft pastels while others have the drama in colour and texture that we are renowned for, combining spring flowers with Roses, Orchids and tropicals. The first range of floral designs, composed with a feminine look perfect for Mother's Day (March 26th), is our "Belgravia Collection." In gentle tints of pink and violet we have combined beautiful spring blooms (Lilac and Ranunculus) with classic Roses and exotic Vanda Orchids to create a tapestry of texture to delight the senses. This Belgravia Collection includes a hand-tied bouquet, a Petite Couture Arrangement (both available in small, medium or large) an oval-shaped table arrangement in one of our elegant containers and an impressive tall design to which we added stunning Cymbidium Orchids. The latter is ideal for Arab Mother's Day celebrated on March 21st, the first day of spring. Our "Chelsea Collection" was inspired for this year's International Women's Day theme of "Be bold for change," a call to help forge a better working world - a more inclusive gender-equal world - to be honoured on March 8th. A blend of gentle, soft pinks with striking, bold yellows suggests the diversity of women, their strength, their courage and their compassion. With Mimosa, Tulips, Ranunculus and Lilac spring flowers carefully crafted with Lisianthus, Skimmia and the lovely Viburnum Opulus, this "Chelsea Collection" also includes hand-tied bouquets and Petite Couture Arrangements (small, medium or large), as well as a large and low table arrangement and a striking tall design with meandering lines of Calla Lilies and trails of Phalaenopsis Orchids. "Chelsea Collection" of spring flowers by Neill Strain Floral Couture; order online for same day deliveries in central and greater London. To wander away from pink we have the "Mayfair Collection" which blends tawny tints and tones of orange, brown and yellow. Exotic tropicals are mixed with Cymbidium and Phalaenopsis Orchids, Callas and Roses for a rich and glamorous effect. "Mayfair Collection" for Spring 2017 designed by Neill Strain Floral Couture available online for central and greater London deliveries. Next, our "Kensington Collection" is a pure celebration of the purity of spring. 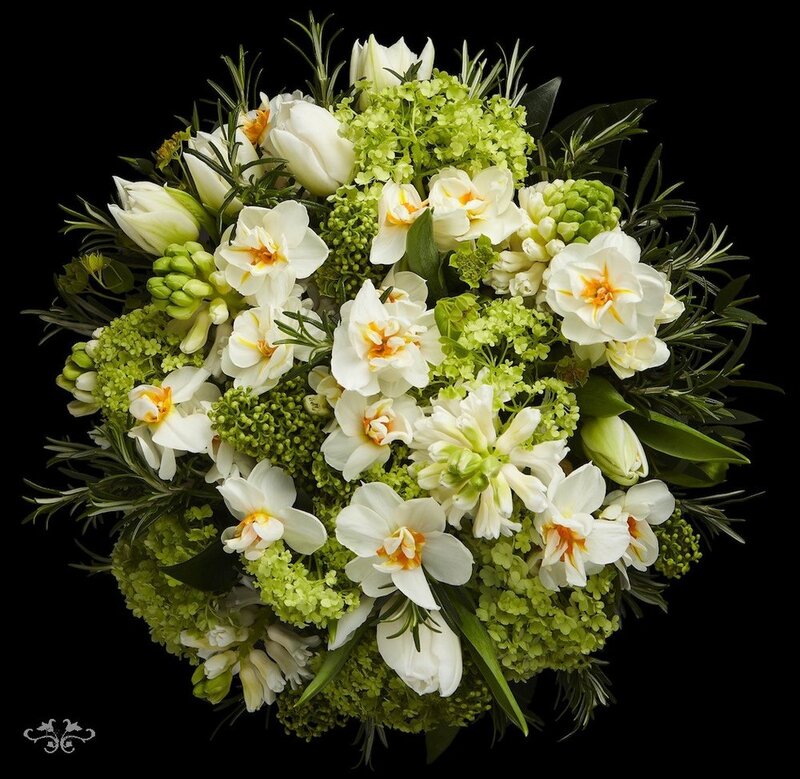 Bright and crisp green Viburnum Opulus and Skimmia cradle the white blooms of scented Hyacinths, Narcissi and Tulips, with long stems of Lilac, Callas, Phalaenopsis Orchids and more in the tall design. For our Persian clients, this Collection was fashioned for the Nowruz festivities marking their New Year on March 20th. 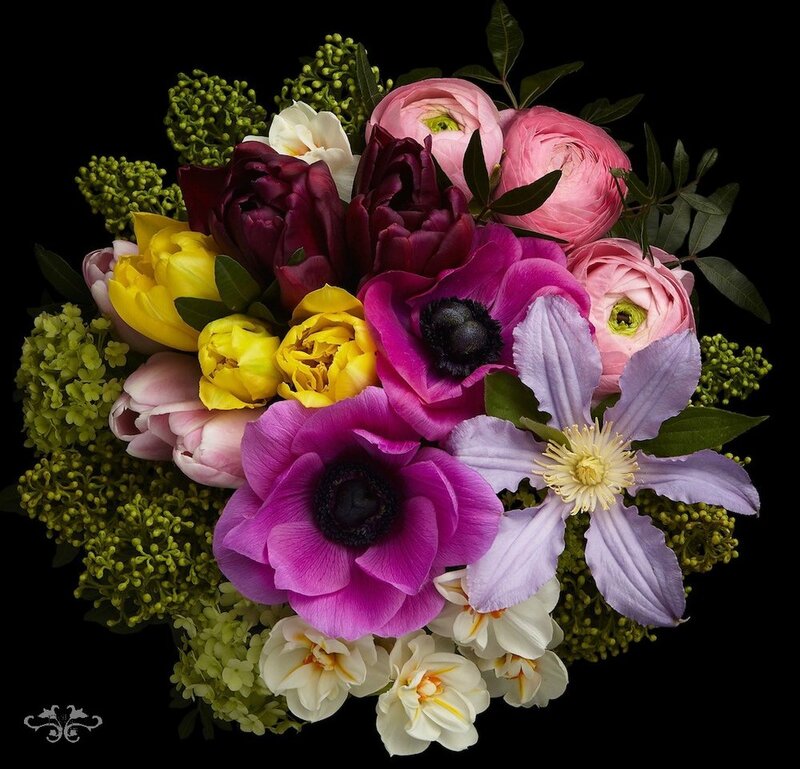 Added to these Collections you will find more exquisite, spring bouquets on our online ordering service but if you would prefer something completely bespoke, then please pop into the Belgravia boutique and let's discuss what you have in mind. I sincerely hope that these designs will not only inspire you to look at our online ordering service or to come and visit us at the Belgravia boutique, but that the beauty of these flowers, just their image on your screen device, will give you as much pleasure and appreciation of the glories of nature in the spring time as they do me.